Running shirts for winter can help to keep you warm as well as make you look great. Here are some of our Favorites. 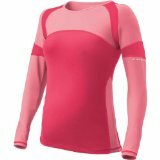 If you are looking for good running shirts for cold weather running, here are some things you want to look for. You don't want a fabric made of cotton, because when you sweat or when it gets wet, it causes chafing. A good fabric content such as polyester and nylon will wick the moisture away from your skin in order to prevent chafing and keep your warm. You want a shirt that doesn't have seems that stick into your skin and cause you to chafe. Here are a few shirts that we like and other running moms have recommended. Under Armour cold gear fabric is built especially to improve circulation and keep your warm while you are running in the cold outdoors. Many of my running friends rely on this brand to keep them warm during winter running, and they have finally convinced me to give it a try. I'm quite excited about flaunting my red Under Armour shirt this winter. Under Armour has many different styles to choose from. So if you prefer a turtle neck then the one above is perfect, but if you are like my sister and can't stand anything around your neck then this crew shirt would be best for you. 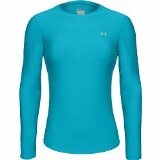 One of the greatest things about Under Armour is that it works great as a base layer so these tops fit perfect under most any other shirts, so if it is really cold put this top on first then layer up to keep your self warm. Brooks not only makes great shoes but they have some great running clothes too. This shirt is long sleeve and light weight, so if it does not get super cold where you live this is a great winter shirt for you. It also makes a great base layer if it does get a little colder. I usually wear this shirt with a jacket over it and if I get too hot I just tie the jacket around my waist and still have this shirt to keep me warm enough on my runs. This is another company that has a great line of running clothes. This shirt helps to regulate your body temps along with spf 50 to protect your skin from the UV rays of the sun. Yes you can get burnt in winter epically if you are out for a long run. This shirt is a little more pricey than the others but it fits great and looks great too. But if you want something with a little more pizazz, check out One More Mile.